The Radionic Ships of the Heavenly Host | Negative and Positive Comparisons. To recap, the fourth dimension is comprised of seven octaves, each octave having seven levels. Each level is higher in frequency than the one below. The third dimension is below the fourth dimension in frequency and the fifth dimension is above. As earlier mentioned, the rule for dimensions is that the higher the frequency the lower the density and visa versa. Substance in the fourth and third dimensions are comprised of Matter Substance. Third dimensional Matter Substance is the lowest in frequency and the densest. The fifth dimension has its own Substantiation called Morontia, which is inertia free. The visible Radionic Ships of Light around Earth are in Earth's fourth dimension, and are demarcated by Radial Cloud formations and condensations. 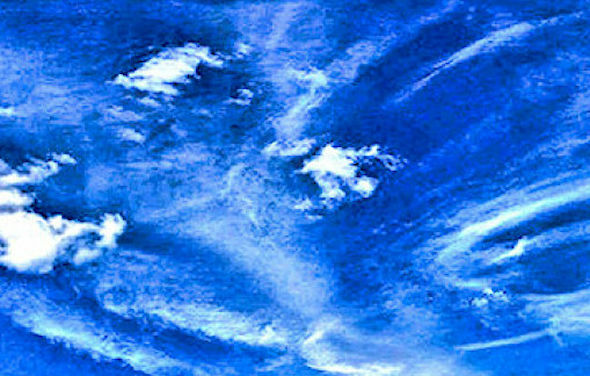 Radial Cloud formations are reflections of the Ship's magnetic field impressed within the local cloud layers. Condensations are precipitations of water moisture produced by the Ships as they sit, literally models of the Ship made out of water vapour in virto. The rule for Radionics is that the higher the frequency the longer the Radials and less the condensations, the lower the frequency the less the Radials and more the condensation. The rule of Polarity for both Radials and condensates is that Negative Polarity things are thicker and/or darker, Positive Polarity things are thinner and lighter. The following are all direct side by side Radionic comparisons. Juxtaposing items often show things that by themselves aren't noticed..' Nothing needs to be said except the Negative versions are shown first and Positives second. Remembering also that Mother Ships are Negative and Father Ships are Positive. The following presents a quick side by side comparison of the various Radionic aspects discussed so far. Providing a quick visual appreciation of the differences. A picture is worth a thousand words. In this case, ten thousand as any of these following comparisons show. Figure 1a - The Mobile Scout Ship and Radials is just above the buildings at the far center right. Previously shown as Figure 37 in Starrgram 13. Figure 1b - The Ships and Radials are as you see them at the center left. From Paris, Ontario on October 11, 2016. Figure 2a - Grey fuzz ball Just right of temple center, Negative Polarity. Figure 2b - White fuzzball lower right, Positive Polarity, previously shown as Figure 42 in Starrgram 2. Figure 3a - Negative Polarity - For the record, photographed outside the Space Station in September 2017. Figure 3b - Positive Polarity - Photographed in Brantford in April, 2016, just a few hours after Figure 21 of Starrgram 3. For the record, the Ship hadn't showed up yet in the earlier photograph. Figure 4a - From the Internet, Negative Polarity. Figure 4b - From the Internet, Positive Polarity. Figure 5a - From the Internet, Negative Polarity, the center ball carries the Polarity. Figure 5b - From the Internet, Positive Polarity, the center ball holds the Polarity. Figure 6a - Negative Polarity. Figure 6b - Positive Polarity. Figure 11 - Negative Polarity Radionic Orb, blow up from Figure 39 in Starrgram 2. Figure 12 - Positive Polarity Radionic Orb. Figure 7 - Blowup from Figure 23 of Starrgram 5 - white rectangular plate upper center with flare and gumballs - Inter-octave gateway portal. Figure 8 - From the Internet, Inter-Dimensional gateway portal.. Figure 9 - From the Internet, Inter-Planetary jump gate portal. Figure 10 - From the Internet, Tinker toy construction center left - Inter-Stellar jump gate portal. A lot of people are aware that an astounding discovery of a fleet of Space Ships off the right limb of the Sun was made in early September, 2018. What nobody knows is what the discovery is actually all about. The simple fact is that it is a major Radionic event in the making. Arcturus has been sanctioned to send in a fleet of people to act as a supplementary aid to the Radionnic Ships of The Heavenly Host. Interstellar Starr Ship travel works in much the same Radionic way as do the Radionic Ships travel around in a local environment such as Earth. To recap, a pair of Anchor type Radionic Ships set up a magnetic field between them in Earth's upper Fourth Dimension and the Mobile Radionic Ships teleport in along the lines of the magnetic field. Only in the case of Inter-Stellar travel, the Anchor Ship pairs are in the Fifth Dimension and could be anywhere around the Galaxy, even in different Galaxies. Once beyond the third dimension, magnetic Fields can exist over vast distances. Once such a magnetic Filed is set up between a pair of Anchor Ships, the mobile can teleport along it's length, like what your Sci Fi writers like to call worm holes. Such an Inter-Stellar Radionic Ship transfer was captured in the making around Earth's Sun on September 8, 2018. In the unfolding event of Armageddon, in the spring of 2018, the number of Radionic Ships of the Heavenly Host in Earth's atmosphere at any given time increased from thousands and thousands of Ships per day to hundreds and hundreds of thousands. As explained in the Disclosure, the Radionic Ships are not corporal and work exclusively within Earth's fourth dimension. The working activity starts with a Monopole pair of Negative and Positive Radionic Anchor Ships that set up a Radionic magnetic Field between them which the Mother Ships, Father Ships, and Mobile Scout Ships are able to ply around in by magnetic attraction and repulsion against the Fields. Normally the Anchor Ships themselves are never visible, only the Radionic Clouds they produce as moisture reflections of their magnetic fields. The Anchor Ship Fields are visible in the third dimension as the Radionic Fields which are presented in Starrgrams 2 and 3. Saucer and Sphere shaped Mobile Scout Ships fall out all over the page whenever a Radionic Anchor Ship Field is blown up. Sometimes in the hundreds. Nearly every photo in the Disclosure contains UFO looking Radionic Scout Ships once blown up. They Mobile Ships are called Radionic because they are not corporal but give off a magnetic Field which precipitates a third dimensional condensated version of themselves in the vapors of the moisture present. Like the Anchor Ships. the Mobile Ships always project together in pairs even if the two are not visible together or are hard to make out. Figure 1 - Radionic Mobile Scout Ship Condensates. That these Mobile Radionnic Scout Ships are around everywhere is proven by the following photo taken off the Space station around September 11, 2017. Notice a pair of Negative Pole and Positive Pole Radionic Scout Ship Condensates sitting in the upper right just off board. Figure 2 - A Negative and Positive Pole pair. To show such Condensates in a better light, the following unrelated Ships were photographed in Kampala, Uganda and Brantford, Ontario respectively. The Negative Polarity Ship is first, The Positive Pole Ship second. With any kind of Radionic Ship the Negative Pole version will always be darker or denser than the Positive. Figure 3 - Negative Polarity Radionic Scout Ship. Figure 4 - Negative Polarity Radionic Scout Ship. On September 8, 2018, an Inter-Galactic Radionic Anchor Ship appeared against the surface of the Sun. The photograph came from spaceweather.com's daily presentation of the Sun's current Coronal Hole activity. The Ship was barely visible. By the time the same presentation was made for September 9th, The Inter-Stellar Anchor Ship was readily apparent along with two Local Anchor Scout Ships sitting in front. In the Figure below the Ship with the dark center is a Negative Polarity Anchor Scout Ship, the Ship with white center is the Positive Polarity Ship. Notice the exact similarity to the Mobile Radionic Ships shown above. The Inter-Stallar Anchor Ship is the large oval with the oval shaped center bulge. The Ship's Condensated precipitations this time were formed from the ionnized plasma of the Sun's Corona. You might recognize that the Ships are also enormous. The Anchor Ship is the size of Jupiter and the Scout Ships are each larger than Earth. The higher the dimension, the less dense and more spread out things are. The Ships are sitting in the Sun's Fifth Dimension, with their condensations visible in the third. Figure 5 - Inter-Stellar Anchor Ship, with a Negative and Positive Polarity pair of Mobile Scout Ships. During the next three days the Ships progressively rotated to the right as the Sun turned in it's orbit, before fading off the right limb on the September 12. Sometime early on the 12 of September, 2018, the Anchor Ship pair set up a magnetic Field between them and a fleet of assorted Radionic Mother and Father Ships teleported along the Inter-Stellar magnetic pipe into the Field. Later on, an amateur US lady astronomer photographed the landed fleet. The Negative Pole Radionic Cloud side of the Magnetic Field set up by the Local Anchor Ships was also visible in the photograph. Like in the earlier Figure 5 above, the Anchor Ship Field and incoming Ships are in the Sun's Fifth Dimension with the precipitated plasma Field and condensations visible in the third. Not knowing that the Heavenly Host are here to help and not hinder, the US Government immediately shut down Seven Solar observatories around the world, who did not want the information to get out to the general public fearting it could be an invasion. Below is one of the photos the lady had taken, found on website www.rense.com and since pulled. Figure 5 - Visible Fifth Dimensional Negative Polarity Radionic cloud and assorted Radionic Mother Ships and Father Ships. Please appreciate that the Sun photo above is highly privileged information. Even though it is up in plain site in the archives of website www.spaceweather.com, no one else has noticed it because no one else knows what's going on about the Radionic Ships of the Heavenly Host and appreciated the connection. Like said again and again and again, the Radionic Ships of the Heavenly host have been hiding in plain sight for thousands and thousands of years, and now they have decided it's time that Humanity knows about heir existence. By now you should be getting the idea that whenever you do take a picture of a Radionic Cloud, you might want to look around inside it to see what else you might have captured. The following book review turned up in Google Books in July 2017 under the keyword 'Radionic Ships'. The review was by an unknown reviewer at Readers Favorites, and says it about as good as it can be said. Keep in mind that the book and website are one and the same bodies of information. What is said about the book says also about the website. 'The Radionic Fleet of the Heavenly Host by Delahnnovahh-Starr Livingstone is a wonderful book for visionaries, a book that beautifully illustrates the truth about the Radionic ships and how close they are to us. The author contends that these ships have been hiding in plain sight for thousands of years. But most recently, in the age of Aquarius, these ships have decided to be more revealing to humanity, and anyone can see them. 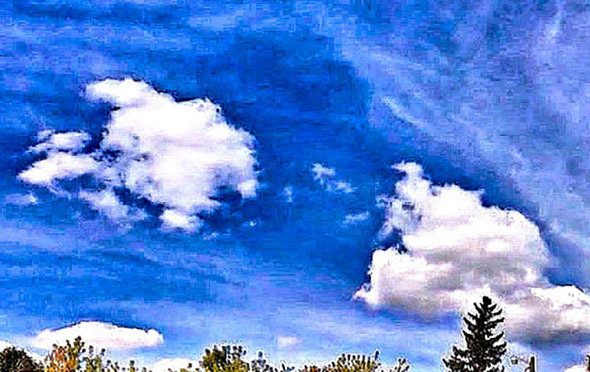 Delahnnovahh-Starr Livingstone leads readers into a stunning discovery, with awesome photographic images that will convince anyone that what appears merely as a Chemtrail or cute lamb could actually be something of a greater mystery.